Knight Benches: Now with Aluminum Slats Too! Our classic Knight bench is classier than ever, thanks to a new aluminum slat option that retains Knight’s clean aesthetic and increases the bench’s versatility. 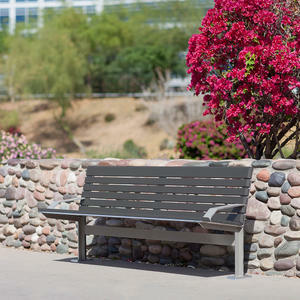 In addition to our hardwood slat options – FSC® 100% Ipé and FSC® Recycled reclaimed Teak – backed and backless Knight benches in both 6’ and 8’ lengths are now available with aluminum slats in a wide range of powdercoat colors. With this update, Knight joins the ranks of F+S benches that offer a choice of wood or metal slats. This means you have even more ways to tailor your bench designs to project-specific material themes. 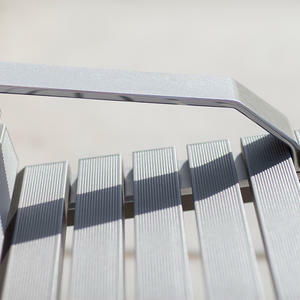 You can now carry the Knight aesthetic into all-metal bench designs. Or go with traditional wood-and-metal variations. The choice is yours. 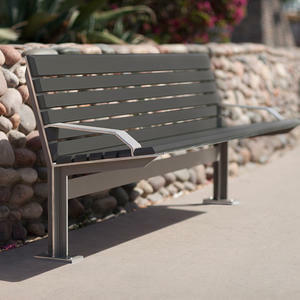 It also means Knight benches offer a broader visual complement to our other Knight family members – especially fitting for Knight litter receptacles, bollards, and pedestrian lighting whose all-metal designs align with all-metal benches in coordinating powdercoat colors. Want to see more? 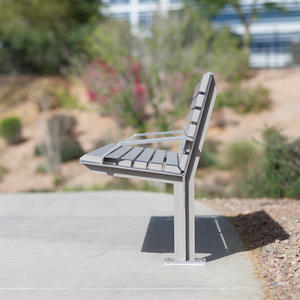 Take a look at the updated Knight Bench product page on our website. Any questions? Email us at marketing@forms-surfaces.com or give us a call – 800.451.0410.